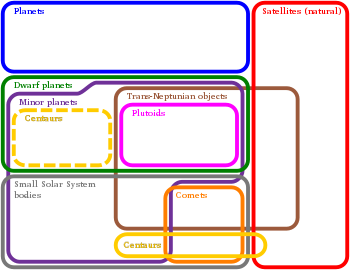 The following is a list of Solar System objects by orbit, ordered by increasing distance from the Sun. Most named objects in this list have a diameter of 500 km or more. Asteroids number in the hundreds of thousands. For longer lists, see list of notable asteroids, list of asteroids, or list of objects by mass. This page was last edited on 10 February 2019, at 19:23 (UTC).